Arkansas's location in the U.S.
Cleveland County (formerly Dorsey County) is a county located in the U.S. state of Arkansas. Its population was 8,689 at the 2010 U.S. census. 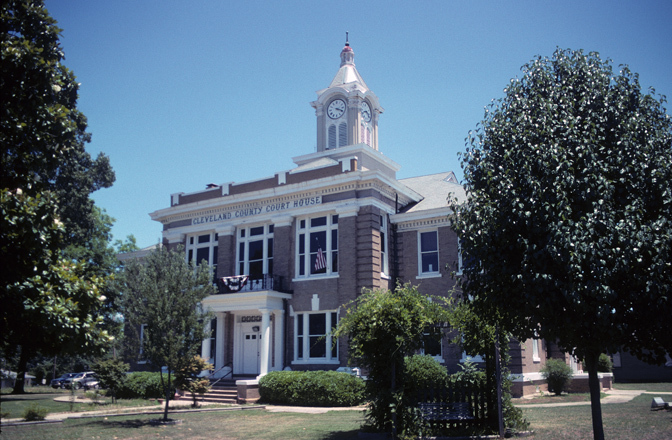 The county seat is Rison. Cleveland County is included in the Pine Bluff, AR Metropolitan Statistical Area, which is also included in the Little Rock-North Little Rock, AR Combined Statistical Area. The Arkansas legislature established Dorsey County as Arkansas's 71st county on April 17, 1873, naming it for Stephen W. Dorsey, the U.S. Senator from Arkansas. When he was indicted for defrauding the Post Office, they renamed it on March 5, 1885, for Grover Cleveland, the newly elected President of the United States. The Battle of Mark's Mills, the pivotal engagement in the Union Army's ill-fated Camden Expedition during the U.S. Civil War, took place in what is now Cleveland County. This engagement resulted in a crushing victory for Confederate forces, though the victory ultimately proved to be hollow when Federal General Frederick Steele and the rest of his army managed to escape from Camden to Little Rock. According to the U.S. Census Bureau, the county has a total area of 599 square miles (1,550 km2), of which 598 square miles (1,550 km2) is land and 1.0 square mile (2.6 km2) (0.2%) is water. As of the 2000 United States Census, there were 8,571 people, 3,273 households, and 2,513 families residing in the county. The population density was 14 people per square mile (6/km²). There were 3,834 housing units at an average density of 6 per square mile (2/km²). The racial makeup of the county was 84.79% White, 13.22% Black or African American, 0.32% Native American, 0.14% Asian, 0.04% Pacific Islander, 0.68% from other races, and 0.83% from two or more races. 1.62% of the population were Hispanic or Latino of any race. There were 3,273 households out of which 34.90% had children under the age of 18 living with them, 62.70% were married couples living together, 9.90% had a female householder with no husband present, and 23.20% were non-families. 21.40% of all households were made up of individuals and 10.00% had someone living alone who was 65 years of age or older. The average household size was 2.60 and the average family size was 3.00. In the county the population was spread out with 26.20% under the age of 18, 7.90% from 18 to 24, 27.70% from 25 to 44, 24.70% from 45 to 64, and 13.60% who were 65 years of age or older. The median age was 37 years. For every 100 females there were 95.40 males. For every 100 females age 18 and over, there were 93.20 males. The median income for a household in the county was $32,405, and the median income for a family was $38,164. Males had a median income of $31,282 versus $21,172 for females. The per capita income for the county was $15,362. About 11.40% of families and 15.20% of the population were below the poverty line, including 21.50% of those under age 18 and 15.70% of those age 65 or over. Townships in Arkansas are the divisions of a county. Each township includes unincorporated areas and some may have incorporated towns or cities within part of their space. Townships have limited purposes in modern times. However, the US Census does list Arkansas population based on townships (often referred to as "minor civil divisions"). Townships are also of value for historical purposes in terms of genealogical research. Each town or city is within one or more townships in an Arkansas county based on census maps. The townships of Cleveland County are listed below with the town(s) and/or city that are fully or partially inside them listed in parentheses. Monroe Schwarzlose, a turkey farmer and political maverick who polled 31 percent of the vote against Governor Bill Clinton in the 1980 Democratic primary. He won in Cleveland County. Youell Swinney, the only major suspect in the Texarkana Phantom slayings, hailed from Cleveland County. He was the son of a Baptist minister. Johnny Cash was born in Kingsland. Coach Paul "Bear" Bryant was born in Moro Bottom. Tyrell Johnson plays safety in the NFL was born and raised in Rison. ^ a b "State & County QuickFacts". United States Census Bureau. http://quickfacts.census.gov/qfd/states/05/05025.html. Retrieved May 20, 2014. ^ "Cleveland County". The Encyclopedia of Arkansas History & Culture. http://encyclopediaofarkansas.net/encyclopedia/entry-detail.aspx?entryID=757. Retrieved August 21, 2012. ^ "2010 Census Gazetteer Files". United States Census Bureau. August 22, 2012. http://www2.census.gov/geo/docs/maps-data/data/gazetteer/counties_list_05.txt. Retrieved August 25, 2015. ^ "U.S. Decennial Census". United States Census Bureau. http://www.census.gov/prod/www/decennial.html. Retrieved August 25, 2015. ^ "Historical Census Browser". University of Virginia Library. http://mapserver.lib.virginia.edu. Retrieved August 25, 2015. ^ Forstall, Richard L., ed (March 27, 1995). "Population of Counties by Decennial Census: 1900 to 1990". United States Census Bureau. http://www.census.gov/population/cencounts/ar190090.txt. Retrieved August 25, 2015. ^ "Census 2000 PHC-T-4. Ranking Tables for Counties: 1990 and 2000". United States Census Bureau. April 2, 2001. http://www.census.gov/population/www/cen2000/briefs/phc-t4/tables/tab02.pdf. Retrieved August 25, 2015. ^ "American FactFinder". United States Census Bureau. http://factfinder2.census.gov. Retrieved 2011-05-14. ^ U. S. Census Bureau. 2011 Boundary and Annexation Survey (BAS): Cleveland County, AR (Map). http://www2.census.gov/geo/pvs/bas/bas11/st05_ar/cou/c05025_cleveland/BAS11C20502500000_000.pdf. Retrieved 2011-08-14. ^ "Arkansas: 2010 Census Block Maps - County Subdivision". United States Census Bureau. http://www.census.gov/geo/maps-data/maps/block/2010/cousub/dc10blk_st05_cousub.html#C. Retrieved May 27, 2014. ^ "Arkansas Governor Harvey Parnell". National Governors Association. http://www.nga.org/cms/home/governors/past-governors-bios/page_arkansas/col2-content/main-content-list/title_parnell_harvey.html. Retrieved August 21, 2012. This page uses content from the English language Wikipedia. The original content was at Cleveland County, Arkansas. The list of authors can be seen in the page history. As with this Familypedia wiki, the content of Wikipedia is available under the Creative Commons License.